I've been doing a new type of training with my dog, Orri. 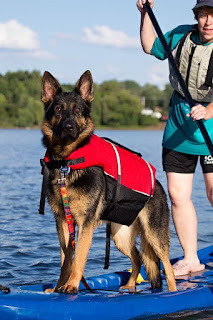 Technically, the training activities help with impulse control (you’ll see it called ItsYerChoice or Doggie Zen), but I see it as a problem-solving activity. Problem-solving activities for dogs allow them to make choices without feedback from the trainer until they make the right choice. Orri is pretty smart, so I was disappointed that as we progressed to more complicated tasks, he couldn’t figure it out. In fact, he stopped trying. As I reflected on that, it reminded me of my work with youth in the 4-H engineering design program. I wondered what I had learned from teaching problem-solving skills to youth that I could use with Orri. In other words, what are the critical elements necessary to teach problem solving? Learners gain confidence as they apply their own knowledge. They discover that some design components don’t work as well as hoped but can be modified to improve results (productive failure). Learners break down the problem into small problems (subproblems and successive refinements). Many times, learners succeed early in the engineering design process but fail later. When they do, I acknowledge it and challenge them to improve by asking “how can you make it better?” Some learners get stuck on a certain feature. By asking them “How can you fix it?” they modify their solutions. This helps them to develop a "mental habit of persistence" and highlights how they are solving the problem. Feedback can also be just to recognize the work they’re doing to think through these problems. It’s training their brains to problem solve, just as you would train a muscle. Brain plasticity and the ability to process positive information is greater in the adolescent brain. Teaching problem-solving skills takes more time than showing the learner how to solve the problem. It may require breaking a problem into chunks that the learner is capable of solving. Study after study shows that developing problem-solving skills in a group environment not only results in better solutions but in better problem-solving skills for the individuals. So, how can these elements be applied to developing problem solving skills in my dog, when I don’t have the tool of strategic questioning? This requires me to apply problem solving to my problem-solving teaching! System: I re-examined the problem from Orri’s point of view. For the first seven years of his training, I had made the choices for him by telling him when he was doing right and when he was doing wrong. So I broke down the complicated tasks into small pieces. Feedback: The simpler tasks allow me to give him feedback sooner so that he succeeds sooner and sees a benefit to keep trying. Time: As he finds success sooner, he is willing to keep trying new things. I’m also allowing more time for training on the smaller tasks. Team: When I get stuck on particular task, I consult other trainers for help. It was a sad epiphany for me was when I realized that because I hadn't been allowing Orri to make choices, he had been giving up when the activity got complicated. By taking short cuts or completely skipping elements that develop problem solving, I hadn't developed his capacity to keep trying different solutions. The great relief came when I realized if I changed my thinking and way of training, his brain has the plasticity to change. As a result, he has learned a complicated new trick. Success! So you can teach an old dog new tricks. Even me! Beautiful dog Margo! I am a stickler for shepherds. I may be biased, but I completely agree! Margo, where is the video of Orri being successful! Thank you for sharing this - I too had an epiphany - that I take short cuts or skip elements when things get complicated. I am going to try to use engineering design process to a couple of situations I am currently working on. Thanks for the idea! I'll bet that's a wide spread occurrence - taking short cuts when things get complicated! I do appreciate the satisfaction of a plan coming together the way I conceived it. And that happens more often when I follow a system to check my plan along the way. Be sure to check my earlier blog on using the engineering design process as you apply it to your current problems. And feel free to share how it worked for you! Very cool. I'll try it with Pax. We are re-introducing him to the cats after 10 months of living apart while we did the house addition. He is having to learn self control/ impulse control all over again too. Let's see if he is as open to the training as his brother. I’d bet Pax is a quicker learner than his brother Orri as Pax did not have to overcome the handicap of a teacher who tried to take short cuts! And from past experiences in working with you, I know you have a deep understanding of the importance of systems, and their value in helping us validate our knowledge and understanding. I have every reason to believe that you'll utilize a system to pay attention to the critical elements that will allow Pax to put his problem solving abilities to good use! Very interesting! Sometimes I feel like I've broken something into small steps, but might have to break things into even smaller steps for those youth who might feel like giving up. I'd also love to see a video of Orri's success! Beautiful dog! I think we've all been there Leigh, or at least I know I have! In some cases, youth have benefited from open ended questions that help them work through the issue, particularly questions like, "what's not going as planned? ", "what have you tried? ", "what else could you try? ", and "have you asked others what they might try?" But when I'm really not getting youth to progress and I've broken down a task into what I think are manageable pieces, and have asked all the leading questions I can, I'll ask other educators to observe/participate in the activity and reflect with them afterwards. Its amazing how an observer will notice some things that should have been obvious (palm to forehead)! Margo this is a great post! I connect to your message of allowing Orri space to make choices. Helping him redefine what it means to make choices instead of choices being made for him is fantastic. To often I have seen adults take this same approach with their kids and teachers with their students. This speaks volumes to the importance of training staff and volunteers in how to become experts in youth development. When we create the capacity for youth to try a variety of problem solving approaches to whatever the challenge is, it contributes to skill set development. Great job at taking a new approach to teaching to meet the needs of your student!